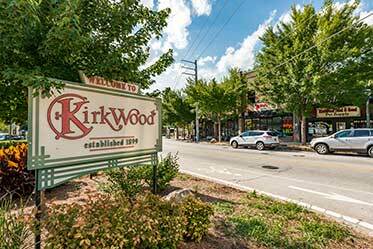 Uncover the top Cabbagetown homes for sale & Atlanta GA neighborhood below. Cabbagetown has always been a weird little anomaly in Atlanta. Bordered by MARTA tracks, a six-lane road, and a historic cemetery, it’s not a place that sees a lot of thru-traffic, despite a location a little over a mile from the Gold Dome. Searching for further information about Cabbagetown properties for sale in Atlanta? Arrange for a private tour by contacting your Cabbagetown real estate experts today! Considering the purchase of a home in Cabbagetown? Call your local real estate team, The Keen Team, at (404) 270-9374. Our community of real estate agents will help you navigate the Cabbagetown, Atlanta real estate market. In the shadow of a once-abandoned factory, a forgotten town revitalized itself into a place where (playfully eccentric) neighbors wave to one another from their porch fronts. This quality didn’t really matter when Cabbagetown was built. The historic homes, most of them still original to the neighborhood, were built for the families who worked at the Fulton Cotton Mill, a massive factory that served as the backbone of Cabbagetown for more than a century. When the factory closed in 1977 however, the community collapsed. Once simply ignored, the neighborhood became forgotten. So in the late ’90s, someone got an idea. Why not turn that big old factory into some cool loft apartments? People thought he was nuts, but lo and behold, these converted industrial spaces started selling like hotcakes (the great loft-living trend of the 2000-oughts was soon to follow). 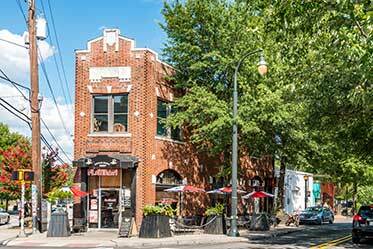 Following suit, the actual village of Cabbagetown caught the wave of revival. Dilapidated homes, one by one, were patched up and restored to their former, humble glory. The Cabbagetown of today still doesn’t see a lot of thru-traffic, which is exactly how the residents like it. The streets are quiet, the people are friendly, and while there are still some rough spots that need a polish, nobody’s in too big of a hurry. It just adds to the charm. Stories vary on how Cabbagetown got its off-kilter name. One tale is that the workers who came to Atlanta from the northern Appalachians would frequently cook cabbage as part of dinner, and that the smell became pretty… noticeable, after a while. Another local legend says that an old Ford Model T, loaded to the brim with the leafy green, overturned, creating a bit of a spectacle (and feeding everyone for a week, at least). 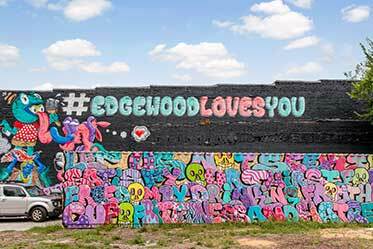 Cabbagetown is located a little more than one mile east of downtown Atlanta. Despite its proximity to the center of the city (and its easy access to interstates and main surface streets), the unique geography of this neighborhood gives it a quiet, secluded feel, with many residents choosing to enter the neighborhood through the Krog Street Tunnel (the lone access point on the north side of town), or via Memorial Drive, to the south. Despite its small size, there are a couple of great green spaces in Cabbagetown. The quaint Esther Peachey Lefevre Park on Powell Street is a tranquil spot that boasts some activities for the kids, while the larger Cabbagetown Park hosts a playground, community center, a few rolling hills, and just enough open space to accommodate the occasional neighborhood event. Street parking is a breeze here (which is a good thing, as many of these old homes were built before driveways were a necessity). While spaces aren’t necessarily designated for individual homes, most residents will agree that finding a spot close to home isn’t a concern. Cabbagetowners looking for a little socializing just need to head north, through the Krog Street Tunnel. There, they find the recently completed Krog Street Market, which features some great food shops, a few quirky boutiques, and some of the best new restaurants in Atlanta. Come to think of it, the same goes for the Beltline. A portion of this iconic walking trail, adapted from an old railroad track, starts just north of Cabbagetown, offering a relaxing (and absolutely car-free) way to get to the bustle of the Ponce Corridor (and Trader Joe’s, obviously). Cabbagetown is served by the Atlanta Public Schools System (APS). Here’s a complete list. The sole entry point to Cabbagetown’s north side is through the Krog Street Tunnel, under the MARTA rail line. Otherwise, visitors can access from the east through a back street in Reynoldstown, or through the main thoroughfare, Memorial Drive, which runs along the south of the neighborhood. Cabbagetown is only a few minutes away from an I-20 onramp (via Memorial Drive). However, driving a little further westward grants easy access to the Connector (a longer drive, toward the east, will eventually meet up with the Perimeter). Though a MARTA line runs right to the north of town, access isn’t as easy as you’d think. The closest station is King Memorial station, and while it’s geographically close, getting to it requires navigating some busy thoroughfares on foot. The elevated tracks of MARTA’s east-west line looms over the whole northern border of town. But this drab, grey wall has been given new life by some of the most impressive, ever-evolving displays of street art in the city—definitely worth a stroll. One part beer festival, one part chili cook-off, and one part bluegrass fest, this event, which takes place the first weekend of each November, has become a local classic, drawing people from all over the city for a day of reverie. Looking to purchase a home in Cabbagetown? Let our Atlanta real estate specialists work with you to navigate the process of buying or selling your house. Our Cabbagetown real estate agents have expert knowledge on the distinct dynamics of the Cabbagetown housing market. For further information about Cabbagetown buyer or seller representation, contact The Keen Team. If you're preparing to sell your Atlanta residence, use our CMA page to uncover the resale value of your Cabbagetown property instantly!